Chilling reports taken from the residents of a Gary, Ind., home recount a haunting that involved a 12-year-old girl levitating over her bed and a 9-year-old boy walking on a hospital ceiling. Astonishingly, the family’s recollections are backed by not only a local police official but also by medical personnel. Latoya Ammons, a mother of three, claims her family became possessed by demons after moving into a rental home in Gary, Ind. For Latoya Ammons, the late night footsteps, the creaking of a door and wet footprints left by a shadowy male figure through her living room were merely child’s play when that was all her family had to endure. It was March 10, 2012 — four months after her family moved into a three-bedroom rental — that Ammons’ saw her daughter floating above her bed, the Indy Star reports. It was first a scream that alerted her grandmother, Rosa Campbell, to the girl’s bedroom at about 2 a.m. that night. Two clairvoyants told them the house was filled with more than 200 demons. The family’s church recommended pouring olive oil on Ammons’ children’s hands and feet, with smeared crosses along their foreheads, as a form of protection. At one clairvoyant’s recommendation, the frightened mother created an altar in her basement with a white candle and a statue of Mary, Joseph and Jesus. It was down there, beneath the staircase leading up to her kitchen, where the family believed the terrifying events began. Rosa Campbell, Latoya Ammons’ mother, claims to have seen her 12-year-old granddaughter levitate over her bed, a claim backed by other witnesses. The mother found her youngest, a 7-year-old boy, inside a closet while allegedly talking to another boy only Ammons’ son could see. The girl told health care professionals that she sometimes felt like she was being choked. A voice would tell her that she’d never see her family again. On April 19, 2012, the family went to see Dr. Geoffrey Onyeukwu, whose encounter with the children was one he said he’d never forget. According to a report by the Department of Children Services obtained by The Star, one of the boys began cursing at Onyeukwu in a demonic voice. He and his brother then abruptly passed out and wouldn’t come to. The children’s behavior was so unusual and unexplainable that doctors feared their mother was suffering a mental illness and possibly encouraging the kids to act that way. Rev. Mike Maginot, who performed exorcisms on Latoya Ammons and her children, was contacted by a hospital’s chaplain a day after Ammons’ children were taken from Ammons’ custody. Then the 7-year-old lunged for his older brother and put his hands around his throat while saying in a voice that wasn’t his own: “It’s time to die. I will kill you,” according to Washington’s report. Once released from his brother’s grasp, the 9-year-old allegedly started head-butting his grandmother. Washington’s DCS report is corroborated by Willie Lee Walker, a registered nurse, who was in the room with them. The 7-year-old boy stayed overnight in the hospital with Ammons while Campbell took the other two children to a relative’s for the night. They returned the next day, which was the youngest boy’s 8th birthday, but were greeted by DCS workers, who took all three children into custody. Charles Reed, the landlord of the allegedly haunted house in Gary, Ind., told the Indy Star that he never heard of demons in the home before Ammons moved in. Another resident has since moved in and hasn’t complained, either. While at the home, the police audio recorder malfunctioned and brand-new batteries died. While listening to the recording later, an officer heard a voice whispering, “Hey,” according to the police reports obtained by the Star. Photos taken in the home’s basement appeared to show a cloudy image near the stairs. When enlarged, the image reportedly resembled a human face. Before the end of the month, a petition by the DCS for temporary wardship of the three children was granted by Lake Juvenile Court. The department argued that the children missed too much school for what the mother argued were illnesses because of their home’s demons. During their wardship, the children were given evaluations by separate psychologists. Each evaluation’s report concluded that the children’s behavior was reinforced by their mother or relatives. Another renter has since moved in and purportedly hasn’t made any complaints, either. 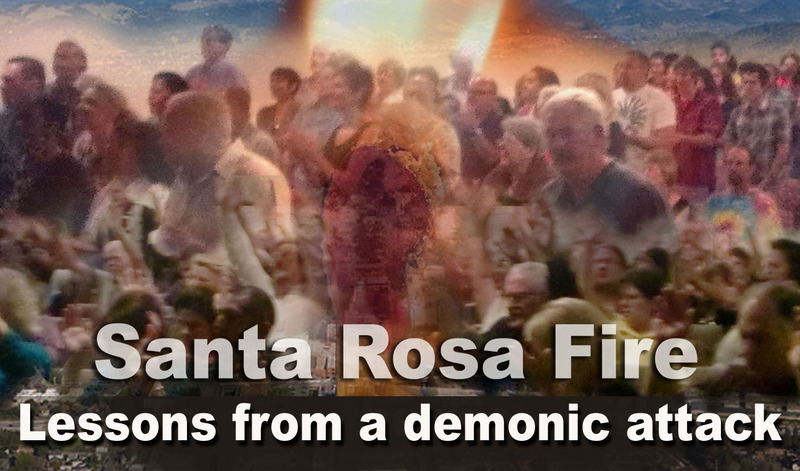 Lessons learned from a demonic attack in Santa Rosa. Late one night in Santa Rosa while laying on my bed a dark and threatening being addressed me. I can tell you this now because of the breakthrough that we had last Wednesday night. It was clear that Satan had sent his local representative to threaten us. We rarely talk about these things because it strains my credibility with a lot of folk. I am going public with this because it is relevant for you to know some things about the immediate future. We have struck a nerve. The enemy only threatens when he is threatened. Ancient principalities are losing their grip. It is undeniable that we are wandering into regions that have felt no threat for decades. These beings knew this was coming and they have no intention of losing this ground. They will attack! We must not be fooled. The danger for any ministry are the extremes of fear and overconfidence. Fear: We can make the mistake of caving into threats and packing our bags. We can look at the array of bad things and use it as an argument to leave. Ministries must have a higher degree of vision to see why they cannot buckle under the lies of Satan. What if our momentum is challenged? Does that mean the end of the revival? Are we here to just have good meetings or to blast through for a permanent change in this part of the world? If fear gets in us, we will constantly be looking for a way out instead of a way in. Overconfidence: Many powerful ministries have carried the heat of the day for this great outpouring. We have only entered into their labors. We cannot boast of any extraordinary gifts or power. This Fire in Santa Rosa is the property of all of the Body of Christ here. WE DID NOT BRING IT AND WE WILL NOT TAKE IT WITH US WHEN WE LEAVE!!! Our authority is only valid if we honor those who have sacrificed for Santa Rosa. We dare not carry a hint of pride that we have brought the missing ingredient to Santa Rosa. This is the result of others who have prayed and held their ground for Christ. Our ability to continue is based on discernment and a Godly fear of grieving the Holy Spirit. At no point we assume that we have achieved some lasting momentum that no longer requires fervent prayer, repentance and a heart of worship. Our dependency must grow and not diminish. Finally, I am moments away from a great over powering meeting in Santa Rosa. The Spirit tells me that great waves of revival are crashing onto American soil and they will appear in many places at once! Soon the supernatural will become normal and the fires of revival will become a way of life for millions of Americans!